Attention Providers... Rule Workshops on Rule 6M-8.601 VPK Provider Kindegarten Readiness Rate will be held via webinar on Tuesday, April 23 from 6:00-7:30 pm and Wednesday, April 24 from 1:30-3:00 pm. To register, CLICK HERE Registration is open for the 2019 Voluntary PreKindergarten Program. 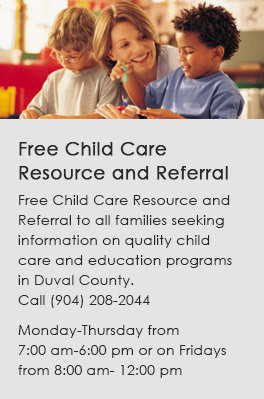 For more information, CLICK HERE Get a FREE developmental or behavioral screening for your child. Call 211 today! New State Mandate. CLICK HERE for important information on House Bill 1091. What if my child keeps getting bitten by another child? What if the child care workers tell me my child is aggressive? What if the teacher tell us he is not meeting certain milestones at school but he is exceeding his milestones at home? How should we partner with teachers on potty training? How can I help my child deal with transitions to new classes? How can I get my child to talk about what he/she did at school that day? What is my baby learning before birth? How do I help my baby sleep? What are the signs of Post-partum Depression? At what age should my baby start crawling? If my baby is drooling, does that mean my baby is teething? How do I avoid spoiling my baby? How do I stop my child from having temper tantrums? What age should I start potty training my baby? When should my baby begin to say words? At what point should I worry if he/she is not talking? When should my baby start smiling back at me? When should I wean my baby from the pacifier/or bottle? Why does my baby cry when I leave the room or their eyesight? What are good lunch options for my child? How can I get my child to eat healthier? What do I do if my child is a picky eater! How can I get help for my school-aged child who needs early intervention services? Who can test my child for developmental delays? What can I do if my child is exhibiting challenging behaviors? Where can my child attend child care if they have been diagnosed with Autism Spectrum Disorders? Que apoyo existe para los niños en cuyos hogares se habla Español la mayor parte del tiempo? Why can I understand my child but other people can’t understand what my child is saying? 2019 VPK REGISTRATION IS OPEN! Do you want to see all FAQ's ? Click Yes.